Fixed dental bridges are supported by the teeth that are adjacent to the missing tooth. They are an excellent way of replacing teeth, and before the advent of implants, dentists found them to be the best way to replace a missing tooth. Fixed dental bridges have some disadvantages, however. We must often remove healthy tooth structure on the adjacent teeth, and the bridge will tie together three or more teeth. Bridges are also much more difficult to floss than implants. 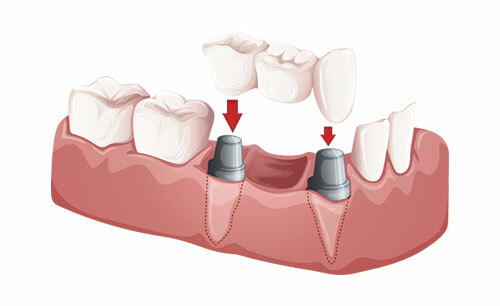 The advantages are that no surgery is required, and we can restore the missing tooth more quickly than with an implant. To find out more about dental bridges and other tooth replacement options, call Dr. Wooddell’s Annandale office at 703-698-9698 or fill out the form to the right. We are located near INOVA Fairfax Hospital, convenient to Merrifield, Burke and Vienna, VA. Dental bridges can be used to replace a missing tooth.